The “Golf & Country Club La Duquesa” was built after a design from Robert Trent Jones in 1987, surrounded by a spectacular countryside. 18 holes with par 72 on 6062m of amusing courses pamper most of all the sunbathers and aficionados of light seabreezes. The course offers large, wide fairways and demands from the player concentration and high precision drives. The second 9 holes are slightly difficult, but offer fantastic views to the Mediteranean, Puerto de la Duquesa, Gibraltar and the mountains. From hole 15, par 4, you can even see Marbella. Hole 17, par 3, is especially mentionable because of its beauty and spectacular 30 meter altitude difference. This golf course is always worth a visit because of its nice and fantastic views. 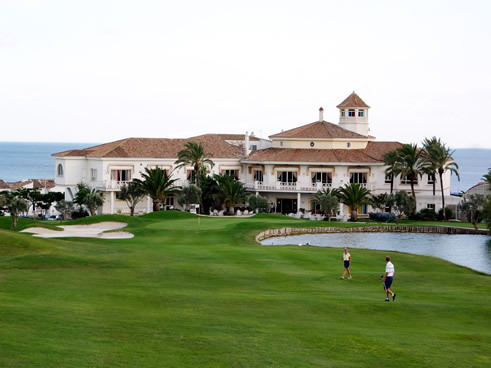 Sometimes they have good offers, for example two green fees for 18 holes + a buggy for 90 €. I’ve played on this beautiful course twice now and it’s excellent value for money.